From the Exchange MMC Console, locate the default SMTP Virtual Server, this is typically the connector that will be used when Exchange communicates over internet. Uncheck Basic Authentication and Integrated Windows Authentication. This will prevent external systems from discovering and cracking internal user accounts/passwords. By default, Exchange will only allow authenticated systems to relay emails, so by disabling authentication, you are effectively disable your system from relaying emails. If you want to be sure that no relay can take place, then you should click the Users button, and in the Relay Restrictions dialog, you should select "Only the list below", and then ensure the list is empty. You have now completed the changes of the Default SMTP Virtual Server. Configure an internal virtual server to accept and relay emails from POPREP. Using the Exchange Management console, create a new virtual server. This connector will be used internally only. It will allow internal systems to relay mails to any Internal or External recipient. – As an extra line of defence you should configure this connector to only allow authenticated systems to send email through it. It will not use the default SMTP port – as it’s already in use by the default connector. Confirm the message complaining that you are using the Same IP-Addresses as the default Server. Open the property page of the new Server. Select the General tab, Advanced, there after Edit, and change the port to 8025. 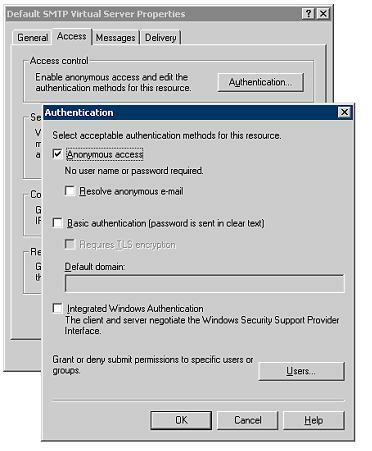 Disable Anonymous access, and enable Integrated Windows Authentication. This will prevent any one from using this server unless it logs on to the SMTP Server using either Kerberos or NTLM. This precaution may not be necessary, but either way no systems will be able to use this Server as a Mail Relay unless authenticated. Under Relay Restrictions, keep the default settings. This will ensure that only authenticated users can send Relay messages. As this connection will be used for inbound emails from POPREP, you may want to uncheck the limits Message Size, Session Size and Number of messages per connection. – This so that POPREP can deliver all queued messages immediately in one session. Set the Server Name for this connection to se same as you use for the Default SMTP Server. 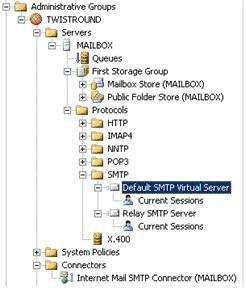 Finally, add the New virtual SMTP Server to your Internet Mail SMTP Connector. In the outbound settings tab, after the SMTP Host Name add :Port No. In order to use the new virtual SMTP Server you just created use port 8025. And – specify a username/password for a valid user in your domain. This account will be used to log on to the SMTP Server. Finally, enable NTLM – Authentication, and disable all other authentication mechanisms. Note, the POPREP – service will never forward an email back to the original sender, as this typically would be seen as an attempt to spoof the senders address resulting in a NDR, and potentially black listing for your server.